The Funky Felter: A Crazy Amount of Views - Crazy in a Good Way! A Crazy Amount of Views - Crazy in a Good Way! I've been quite behind lately in listing anything new in my Etsy shop. It is not that I don't have new items to list, but rather that I just have not made the time in my schedule to list any of my latest creations. 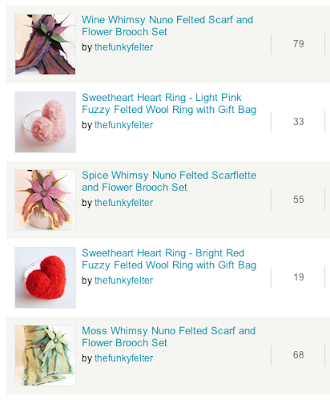 This past Friday, I finally got around to listing my nuno felted scarf and flower brooch sets. They are what I like to call my Whimsy Collection because of their fanciful, delicate design and dreamy color schemes. I am in the process of making more sets and separates along this theme so I will be adding even more to my shop as the season progresses. After the good response that I got to them on my flickr photo gallery a few weeks ago now, I was very excited to see how well they did on Etsy. Although none of the three sets that I've listed have sold yet (yes, I am very optimistic - the best way to be! ), they have gotten an unusually high amount of views, at least for my items they have. All three sets combined have gotten over 200 views since I listed them on late Friday afternoon. I've checked to see if they have been in treasuries or featured elsewhere in order to have such a high number of views, but I can't find that they have. It makes me very happy to see such a good response and interest in my newest style of scarves and brooches. And, hopefully, they will end up making great holiday gifts for some special someones out there! Also, if you are interested in my scarves or any of my other shop items, I suggest that you sign up for my monthly newsletter. It is one of the few places that I offer promotional discount codes for my Etsy shop. They are usually great deals too! And, I only send out a once monthly email plus the very occasional extra promotion or announcement so I do my best not to spam you with a lot of unnecessary things. I put a set on "This Next" a couple of days ago. thanks to both of you :) maybe that explains where all my views are coming from. The scarf is really lovely. Those are great views for all the problems Etsy is having with things not showing up in search.